Often the room considered to be a home office soon becomes a place where paperwork, bills and electrical gadgets cover the furniture, shelves and even the floor. Why not take advantage of the Spring time to transform this “work corner” into a fully functional space? A home office corner is more important today than ever, especially with technology making it easier for more and more people to work from home. Here are a few ideas to create a practical, stimulating and comfortable work environment. Whatever your reasons for wanting a home office, it is important to choose the location carefully. It is unwise to put the office in the basement or in a spare room before analysing your needs. If you are self-employed or if you run your small business, consider what you will be called upon to do and how many hours will you be working in this room. Think first about its use and determine if it will be used for one or more people before you choose it. Do you meet clients? Do you need more than one computer? Should you have a conversation corner or install a small conference table? Then focus on comfort and brightness of the space before you organise it. Is the room well ventilated, too cold or hot? Is it tucked away in the house or used as a transit space? Is it quiet or noisy? Not everyone has the same work habits. While some can stand noise, others need peace and quiet to work best. You should treat the organisation of your home office with as much attention as the other parts of the house. The area should be inviting and promote calmness, enticing you in so you are more then happy to work there. Lighting is very important: try to make the most of natural light; if the office is in the basement, choose a pretty lamp that will sufficiently light up your desk. As far as colours are concerned, the choice will depend on your personality and your job. If you have a creative work, you can choose brighter colours than if your job is more traditional. Plants will help you liven up and furnish a little office with ease. With tablets, compact computers and smartphones, work has been made easier. Opt for a combined printer, scanner and fax. If you work full-time at home, do not get tempted to turn a sofa into a workspace, as the most important element of an office remains the chair. Without realizing it, we can spend hours sitting in front of the computer to surf the internet or work. If this is your case, the purchase of a good office chair, comfortable and ergonomic is a necessity and not a luxury. Forget the kitchen chairs and opt for something practical, adjustable and comfortable, an ergonomic chair helps maintain a good posture. Don’t forget to get a carpet that you will slip under the chair, that way you will not damage the flooring. To work well, you need space. If your desk is buried under a stack of documents,, it will be difficult to concentrate. 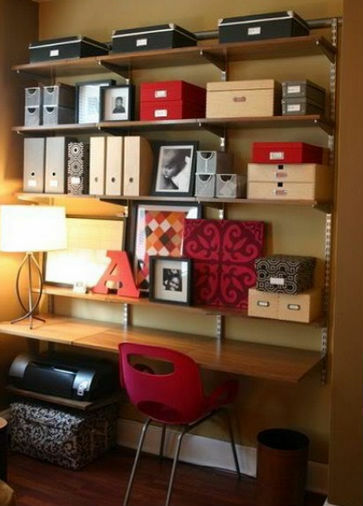 Plan where to store office equipment (pencils, stapler, calculator, etc.). In an office, there is never enough storage space. Closed storage allows you to hide the mess. Behind closed doors, add shelves and baskets to make filing easier. If you are old school, and your appliances are not of the wireless generation , you will find intelligent solutions, such as adapters hiding the plugs and wires. It is also possible to gather wires into casings designed for this purpose . If you do not have a dedicated area for your office, don’t panic! 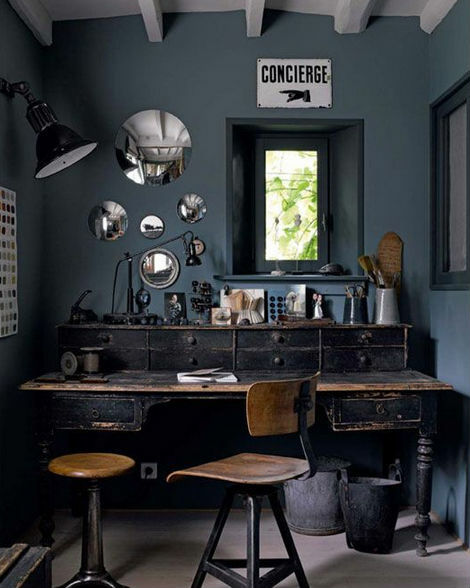 There are plenty of spaces you can turn into a small functional office in most parts of the house. It often just takes a little creativity to work with the space you currently have. However, if your plans are grander and require more space than currently available, a small office extension may be the right solution for you. This article was posted in General, Home Office. Bookmark the permalink. Follow comments with the RSS feed for this post.Post a Comment or leave a trackback: Trackback URL.